In which our hero heroine is late for a very important date! The twins are too close for comfort, Mori chops wood for no reason, and the newspaper club overestimate Tamaki while underestimating the rest of the host club. Whoops. Housekeeping: [INSERT QUESTION ABOUT POTENTIAL IGNORANCE HERE]? If so you can find out more about the Ani-Club and how to participate via this finely crafted link. Standard tenets of Ani-club apply: discussion is only for the series up to this point, no spoilers for later episodes. First on the chopping block is episode 13, Haruhi in Wonderland. And I have to say, what an episode it was. I wasn't expecting it to be nearly that good. From the preview it just seemed like standard wackiness. But they managed to work a lot in underneath the bizarreness of the dream. It was such a subtle build up, and then when Haruhi wakes up. A tear rolling down her eye murmuring for her mother? Bam! Right in the heartstrings! A very clever episode, and the characters were great fits for their Wonderland guises. 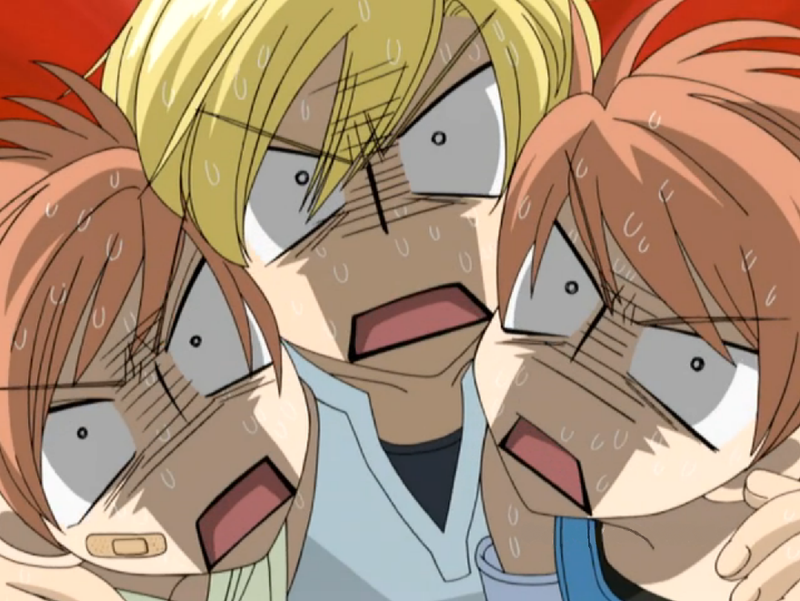 Kyoya as the caterpillar and the twins as the Cheshire cat? Perfect. Episode 14 wasn't quite as memorable. The set-up is an old cliche. Rival believes idiot to be genius mastermind who's thwarted him at every time. Rival discovers idiot really is just an idiot. Tamaki as always was pretty entertaining though, and there was a nice little revelation about him at the end. At the end the episode was really more about developing his character than it was the plot around the news club. Episode 15 was good. The twins sleeping in the same bed and draping over one another outside their antics in the host club was a little weird though. I did find the deadpan poker faced twin maids amusing though. It seems like they might get some more character development in the coming episodes so it'll be interesting to watch that unfold. The over the top transvestite was a bit aggravating, but I found the comparison to Renge hilarious. And the competition over who got to stay in the guest house was amusing, especially after Kyoya revealed they all have property in the area. And who is Arai? An old boyfriend? Next episode Haruhi and Hikaru go on a date. And Haruhi has twintails for some reason. Remember to add your contemplations and revelations below. Uh it also appears I miscalculated, there's 26 episodes in this series and not 24 so we'll have three more weeks of three episode blocks capped with one last week for the final two episodes. Nominations for the Ani-Clubs next series will open the week after next, with voting opening in the penultimate week of the season and closing with the season finale. So remember to watch episodes sixteen, seventeen, and eighteen by next week.